Bandwidth, download speed, resolution, processing power. In just a few short decades these terms have become ubiquitous and vital to the majority of the world’s citizens. Whether in a discussion of the latest phone or in an ad for a local internet service provider, these terms are almost always hinting at one thing: video. With the ever-evolving capabilities of the internet and the devices we use to access it, video has become one of the most significant forms of content consumed as well as one of the major forces driving innovation. The ability to stream, download, and watch video is one of the primary measuring sticks used to gauge the quality of services and technology. When it comes to marketing, video has also become an essential way for businesses to communicate with and engage consumers. 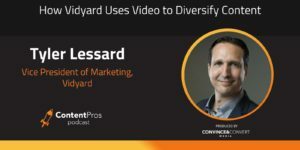 Tyler Lessard of Vidyard is on the front lines of video marketing and has a lot to say on the matter. 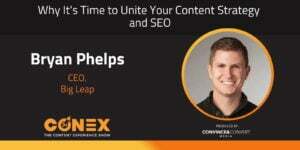 In this special episode, he moves from the host chair to the guest seat to share his thoughts and say farewell as co-host of Content Pros. Can you give us a sneak peek of something you’re working on that you’re really excited about right now? Tyler is currently working on a series of campaigns that parody popular game shows. This was actually inspired by a Family Feud parody that Randy put on at the The Content Experience in 2017! Randy: Welcome to the Content Pros podcast. I am Randy Frisch. 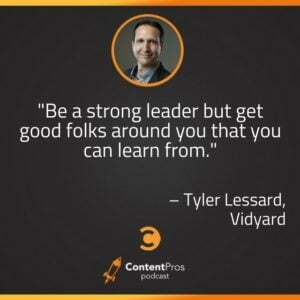 As always, I get to say that I've got Tyler Lessard with me, and today I do, but today is actually Tyler's last podcast as co-host on Content Pros. We're calling this the farewell party. It's just gonna be myself and Tyler for the next 20, 30 minutes or so, and we're gonna talk about some of the things that Tyler does on a regular day because reality is, on this podcast, Tyler's brought a really interesting perspective of questions for the people who come on the podcast and we always see that video [inaudible 00:00:37] from him sometimes, but the reality is, he's running an entire, really forward-thinking marketing team over at Vidyard. We always get to touch on some of the campaigns he's done and I thought it would be really fun just to learn a little bit more about his take as a marketer, his focus on where content comes in, so Tyler, welcome, not as my co-host today but as our guest on Content Pros. Tyler: Hey, thanks Randy. It's great to be here on this side. It's been an incredible year or so as a co-host of Content Pros and it's been a pretty phenomenal opportunity to meet a lot of great people and to learn a ton of things, of course, myself. Of course, it's been fun. I could talk about content marketing, digital marketing, demand gen all day long, so it's been really great but I love this opportunity to share a bit more about what our own team has done because over the last 3 to 4 years, here at Vidyard, I'm really proud of what our team has accomplished. We've always had a content first, thought leadership first, sort of mentality within our organization and it's gone a long to building out, what I think, has been a pretty compelling content marketing program that's really fueled by our overall goals as a team. Randy: Yeah. It's funny Tyler, I remember when Jay Baer called me to talk about having a new co-host. I'd been doing this podcast I guess for about 3 years now and we've had a variety of different co-hosts come on and help me run this show, and you've done a great job with that. But I'm gonna admit, I was pretty nervous when Jay told me about this. I remember where I was, as I was saying, I was in Vancouver visiting some family. I get this call from Jay saying "we're gonna try something new here." When he told me Tyler, I was like "Alright, I love Tyler. That's no problem." But then it kind of settled in, I was like "I don't know. Is he just gonna talk about video all day long? Vidyard, obviously it's a video platform and an amazing one at that." But I'm like "Is it gonna be like the video Content Pros podcast?" I've got to give you credit because I think you definitely have real great insight on the video side but you challenged a lot of our guests in terms of their thinking and brought out some really interesting ideas that go well beyond video. As a result, I think that's a great topic today to maybe even dig into. How does that mandate to balance content and diversity of content within your own team happen, when naturally there's gotta be an expectation? Okay, we've got to go heavy on video. Maybe we can focus on some of the other stuff and almost from the top down of how did that get embraced through the company. Did you have to fight for that? Did the CEO just agree out of the gate? Yeah, absolutely we can be diverse with our content assets? Tyler: Yeah. Well, I mean it really goes back to the beginning and something I mentioned earlier, which was a commitment at an organizational level of being thought leaders within our market. Many years ago we recognized, we're in an emerging space, we need to of course promote Vidyard but as much, we need to grow this market of video marketing, and video selling, and the areas that we're in because it's relatively new and the market, frankly, really wasn't ready a few years ago. There was always a commitment top down to investing in thought leadership and investing in a content strategy that supported that. As we looked at that and thought about "What does that really mean?" As modern marketers, we sort of gravitated towards a whole range of different types of content that we felt would be needed to fulfill that. We certainly have always had a slant towards video but we recognize, like anyone else, that you need a diverse set of content to appeal to different types of audiences, to appeal to different types of actions, and to appeal to different stages in the buying journey, so we've always sort of held that near and dear to our heart, of being marketers first, being thought leaders first, and then letting the content trickle down from that. But one of the things we, of course, do have the advantage of is a strong commitment to things like video and rich media, that help us make sure we cover that area in addition to those other things that we do on a day to day basis. Randy: Right, so maybe you can talk about how you figure out what format is going to be best for the audience. We've had a lot of guests on this podcast who've helped us educate in terms of thinking about that buyer journey. I'm remembering one, probably about a month ago, people can go and check it, Contentprospodcast.com with Stephanie Toddy, she actually went in and talked about how we map that buyer journey, if you will. I think she talked about having an excel sheet and the different stages, so is that a similar type of approach to the way you're taking it? Where you think first about who you're gonna engage with and then the format? Or do you create the format and then kind of map what the assets you have to the different stages in the buyers? Tyler: Yeah. There's certainly a little bit of both. We take both angles of defining our target audiences, of course, and those sort of key messages at each stage of the buyer's journey, and make sure that we've got a content strategy to nail that. But in parallel, we also give our content team some independent capabilities to define a parallel track of content that we believe is important to, again, just sort of further that industry thought leadership, our SEO targets, and things like that. We try to nail both sides and walk that fine like but one of the really big things for us and my perspective on this, you asked how do we figure out what's the right content type for the right audience member at the right stage. I don't think there is ever a silver bullet or a single answer to that. Hopefully I'm not contradicting something I've said in the past on this. But I mean, honestly, I feel like everybody's different and there could be somebody in a certain role at a certain stage of the buyer's journey, who's gonna prefer a long form e-book as something they want to engage with and consume offline, somebody else who's gonna want to watch a 2 minute product video, and somebody else who's gonna want to watch a 3 minute customer story. I believe that you really do need that diversity and content types to appeal as broad as you can to those different audiences and there's never a one type or a one size fits all. It's a challenge to really balance that and think about "How do I manage that?" If I'm thinking about this message, I have to have blog post, and an infographic, and a video, and all these different types. But that's just where you've got to really be smart about how you repurpose content, how you use hub and spoke models to think about a hero asset, sort of content assets that can stem from that, derivative content pieces, things like that. I'm really passionate about that and think a diverse portfolio of content, if you will, is the key to success today. Randy: Yeah. It's funny as you talk about that, one of the stats that I've become obsessed with of late and it's almost in every presentation I've been doing lately, both internally and externally, is this ... We've all seen it before. It's from [inaudible 00:07:44] and it talks about how, I think the number these days, is 6.8 decision makers weigh into the buying decision. Right? As you were describing the need for different assets for, not just different stages but sometimes just different people, I think that the two go hand in hand. Maybe you can tell us a little bit about how you think about different buyer personas at Vidyard. First of all, how many do you prioritize? How many do you have and how many do you prioritize from a content creation perspective? Tyler: Yeah, so we have probably in the area of 6 to 8 key personas that we focus on as a marketing organization as we're producing content and sales enablement tools and so on. But we really focus in on about 4 key personas at any given time. We try to chunk our activities into either the quarters, or half years, or what not. We try to apply to a bit more focus. Generally, it's 3 to 4 key personas that we're focusing on as we develop a series or a portfolio of content. One of the things that we found is, again, this important of testing different types of content, different formats, different lengths, to see what's gonna work with some and perhaps not with others. We have learned some things. We target ... One of our personas are demand gen leaders within marketing organizations. Another persona is content marketers and video producers, and then another persona, we also sell into sales teams, and so we target sales leaders as well as individual sales reps. By just, again, testing different formats and types, we've found strong differences in what they'll engage with. We find marketers, in general, are more apt to attend, or at least register for and attend, longer form webinars, for example, but when we do a 45 minute webinar for a sales audience, it's like crickets. Right? They're just like "No, thank you." Right? But if we serve up a 2 minute how-to video to a sales audience, that's gotten really good traction. You learn, again, there's some of the marketers prefer written longer form content and, again, some of the sales reps and sales leaders we've seen tend to prefer also pure based content, so things where we have other sales leaders talking tend to get higher performance than those where we're the ones trying to espouse our knowledge. You learn those nuances as you go but you can only learn it, of course, as you test different ideas and different formats. Randy: That's really interesting. How do you get that insight to figure out what format is actually working? I mean obviously on the video side you guys have really great insights to understand when there's engagement, when there isn't. What's your system of record for that and who on the team, and I'm really curious about this one, it's not just one of those "We have to ask the ROI questions." But it's, is this the content team's responsibility, is this the demand genre team's responsibility, to figure out what format is actually working. I'm gonna assume that's [inaudible 00:10:51] marketing animation platform but maybe elsewhere? Tyler: Yeah, it's a really important point because we are lucky enough to have invested in marketing automation, as well as attribution reporting, solutions, and sort of a practice around ROI and attribution tracking for a number of years now. We've built that into the systems and we're able to track at a content asset level, at a campaign level, at a channel level, which content pieces or, which programs are generating engagement, which ones are generating lead flow, and which ones are generating or influencing pipeline and revenue. It takes a while to get there, to mature the systems enough to be able to get to that level but we're lucky enough to be there now, so we are looking at all those and we want to be mindful of that because there isn't, again, not necessarily a single metric that everything ladders back to. Of course, revenue would be that one but if you think about our blog is all about inbound engagement, audience building, and we're more interested in those sort of [inaudible 00:11:59] metrics, so we look at the types of blog posts that are generating link backs, which ones, of course, are keeping audiences engaged, which ones are seeing the highest returns there. But on the flip side, our demand team will look at longer form content assets, they'll look at webinars, they'll look at thought leadership interviews and other videos we do from a lead gen and a pipeline perspective and so there, we'll see, as they distribute those to our audience or via third party channels, which ones are performing best with respect to downstream pipeline and revenue influence. Those are the things that we care about at the end of the day. Randy: That's really interesting. So usually at this point, to kind of reveal the cloth in Wizard of Oz, you and I would be typing to each other because we're never in the same room when we do these podcasts and I'd be like "Tyler, I think we should take it to the sponsor break right now." But now, it's all on me. I mean, you're the guest. I just have to figure this stuff all out. So we're gonna do a quick break here. We'll be right back on Content Pros, on Tyler's farewell party. We're back here on Content Pros Podcast. I've got Tyler Lessard on his final co-host/guest podcast with me. We're just kind of talking about the way we each go to market on our content strategy and I want to run something by you that actually happened on my team about a week or two ago. We're nearing the new year. We're nearing the new calendar here year and we're trying to think of what's gonna be our new stance going into the new year and the person who oversees our content strategy here came and he had this really creative idea, I won't go into the idea, but the real dilemma here was that his approach was this would be a campaign where we would release 28 pieces of content for the month of February. Right? Each of those assets would be really great and the idea would be that we'd have this 28 day campaign. And I said to him "Yeah. I really like the idea. The creative is really good. The concept was really good." I'm like "But what do we do with it after February? If it's 28 days, it's super cute for February. The challenge then becomes how do we use it? Say we go to an event and we come back from that event in April, how do we use that? And he's like "Oh, well we'll just repurpose it at that point." And I'm like "Well, why do we have to repurpose it? 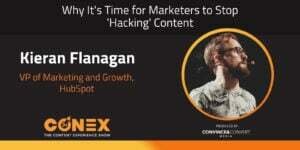 Why don't we start to think about our content creation, whether it's the assets, whatever it is, more around the lens of a program as opposed to a campaign?" To a degree it's semantics but at the same time, it's a real big debate that I think we have. I guess, if I'm to put this question to you, is I think at Vidyard you guys have done some awesome, I'll call them campaigns. I love what you did with Stranger Things back at Halloween. You guys do your [inaudible 00:14:54] talks, you've got a lot of different campaigns that go on. How do you think of them in terms of being created for a certain moment in time versus a set of assets that continue over time? Tyler: Yeah. It's a great question. I'd love to say that everything we do gets repurposed and lives on forever and are the gifts that keep on giving but that's not always the case. We do try to balance things and I think, again, that's a really important strategy, is to have a bit of a balanced approach to that because if everything you do are one and done campaigns then you're constantly fighting fires and you're always trying to ... You always feel like you're behind because you're trying to get the next campaign out while your lead flow is waiting. But on the flip side, if everything is long term programs that are repurposing, then you miss some things that could be very timely in the market or relevant in a certain period. We do try to balance. It's a bit of a compound answer, but we try to balance both. We use an agile process in our marketing team where every 3 weeks, we visit what are we gonna do in the next 3 to 4 weeks, some of those are gonna be continuation of long term programs and some of them are gonna be net new. It'll be like "Oh, hey we just heard one of our competitors is really suffering right now. Let's fire up a competitive campaign because there's a big opportunity." I won't mention any names but yeah, that's something we're doing right now because our sales team, a couple weeks ago, said we just won a couple of big deals and we found out that our competitor is forcing customers to upgrade or to change platforms and we're like "Great, so in 2 weeks, let's launch this competitive campaign." We're gonna produce a personalized video that will go out. We're gonna arm the reps with some new creative assets that are competitive and that's gonna be something that ... It'll be a bit of a one time campaign but of course those will be used in the future by the sales team. I think you have to be nimble and do both. I'm gonna give you one example that we just did that I think is similar to the idea of the 28 days of content, or whatever you'll call it. We just recently ran ... We do a virtual event twice a year and we call it Fast Forward and we just did it November of this year. Randy: It was awesome. I was honored to be one of the sessions on it. Thank you. Randy: You just want to be invited back as a guest now. I never used to get that stuff from you but thank you. Tyler: But one of the great things about that was, and why I love this and I love that idea of doing it's February, let's do 28, it's this really great sort of rallying point and call to action for the team to come together, and band together, and produce a lot of great content in a relatively short period of time. For Fast Forward, the really cool thing was, we say "We're gonna throw this great virtual event." And for me it was almost an excuse to go out to thought leaders in the market, to partners, to customers and to sort of rally them into doing some sessions with us. If I had gone to, say yourself, Randy, and said "Hey, do you want to do a webinar for us?" You would've been like "I don't know. What's in it for me?" But when I come and say "We're doing this virtual event. We've got folks like A, B, and C speaking and we're gonna have 2,000 attendees." Then there's a greater incentive for you to participate and it's sort of bigger than just [inaudible 00:18:15]. For us, it was really cool because we got, it was about 20 or 25 sessions, as part of that virtual event. You know, we planned it for a good 3, 4 months but now, my content team is just like, they're stoked because they've got all this great content that they can reuse throughout literally the next year and repurpose them as blog posts, as on demand webinars. One tip that I had was, we made sure this time that the branding around the presentations wasn't specifically fast forward branding, so the event was but each session was its own brand, so that we could take it out and repurpose it outside of the virtual event itself, and again, make them the gifts that keep on giving. So I love a program like that as a rallying point to get everybody together to produce a bunch of great content in a short period of time and even get others involved to make it something bigger than just a single piece. Randy: I love that. It's funny. I asked the question and I guess I'll [inaudible 00:19:06] to you. I agree. We need to do a balance. And it's interesting. It is holiday season right around now and one of the things that, as much as I think we have to move more to program based content, one of the exceptions that I will never give up for our team is the importance of a holiday campaign. Right? Now, regardless of whether it's there to last or you can get it long enough, it is the most bonding experience for your marketing team to put together a holiday campaign. I don't care how big or small it is, everyone rallies and it almost doesn't matter. I'm a Jewish guy but I love Christmas. I'm all on board any time there's a Christmas tree or an opportunity to celebrate and our team, recently we did, I don't know if you saw yet, Tyler, but we did this campaign called ABM Saves Christmas. It plays off the idea of Santa as the ultimate ABM marketer who needs to deliver personalized gifts to every kid around the world. Our team just had fun with it because it was something they could all wrap their heads around, it was something our audiences would, but more than anything, as you put it, it's those opportunities for your team to come together and rally around a big project, which is really important for team building aside from targets. Tyler: And creating things that are also a lot of fun to do, which is, as a marketing team, that goes a long way but also the thing that I love about them, is that something that we put out to our audience, that are the ones that generate really personal, emotional responses from people and it's not the, oh, we're not so focused on lead generation but we're thinking about how can we just connect with people on a more human level and put a smile on their face. You mentioned at Halloween we did a spoof of Stranger Things, which season 2 was launching at that time, and we did strange reviews and we did a bit of a spin on the plot where there were unknown people from the upside down watching your videos and, of course, this fun character from Vidyard who was a playoff off of eleven, was there to help you sort of identify these unknown viewers. It was so much to build as a team, to put out there, but the response we got, I actually had a prospect of ours complain because they didn't get a personalized version of that video sent to them. It was like an epic moment as a marketer, where I had somebody complain that they weren't included in a campaign that we launched. And so of course, we spun one up, we sent it to them and they were like "Thank you. Thank you." But those moments where somebody asks to be added to your list because they want to see your content is so warming to the team. You typically don't get that with a traditional demand gen.
Randy: Tyler, I love that. I mean I think that's the dream of every marketer, that people are craving our marketing, they're engaging in our marketing, they're loving our marketing and I think kudos to you and your team because quite often I am very envious in showing some of your assets to my team. You guys re definitely executing on that end. I know we said we were gonna talk about diversity of content but I can't help, I mean, you're the video guy so we've got to touch on video at some point on your farewell tour here. It's funny. I think I've actually increased my buy in to video and I was already, I mean you'll agree, I'm a pretty bought in video guy, but I think more and more these days, video is just helping us stand out. I'll give you an inefficient way that I'm doing [inaudible 00:22:59] these days and maybe you can give us tips of how to do this better, but one of the things that I love as a channel for distribution of content is LinkedIn. I think it's probably still the best social platform for doing so these days. One of the things I've found though is that when there's a video embedded on LinkedIn that you have to play and it's gotta open up in a separate app, it's an extra step that you have to do, whereas when you actually have that native video playing. What I've actually started to do, you may have noticed on my LinkedIn feed lately, I'm getting the mp4 files and uploading them onto linked in, which is more of a process, really clunky, but the engagement I'm getting, the views I'm getting, the comments I'm doing when we do these things are above and beyond, so I guess, how, without strictly answering on LinkedIn, how do we get to this more video on demand world, where it breaks through because it's easy to consume? Tyler: Yeah. Well, I think you nailed it with the notion of being easy. What we need to do as a collective is make video easy to create as well as easy to share and consume, and you mentioned easy to consume, but we need to make all of that really simple for people and I think that's when you'll really see an explosion of it. You made a perfect point there of, if I want to do native video on LinkedIn, it's still a bit of a chore and I feel like I'm jumping through hoops. Facebook's a little bit easier, kind of recording it, natively sharing it but I think that's the crux of it and today I think it's a lot easier than ever to create good video content and we see people using their iPhones, of course it's only a few hundred dollars to buy a good quality DSLR camera, video editing software comes native on a lot of laptops these days. I think for a lot of people and I think, like yourself, I strongly encourage, just start doing it, just start trying it. If you don't have a dedicated video person in your team, maybe give a whirl yourself or ask around of who has some video capture and editing skills that can help out. Things like that are a great place to start. Right? I'm gonna record a quick thought leadership conversation or I'm gonna answer a question and put that on LinkedIn, or put on our Twitter or Facebook channels, put it on our blog. Right? Why not? Those are things you can do pretty easily and one of the big things that we're focused on right now, both within our team and also within our product, is that notion of making it easy to do these things. We launched a tool a little while ago called Vidyard Go Video that enables anybody to just hit record from their Chrome browser, record from their webcam or do a screen capture, and then one click to embed the thumbnail image in their email and send it out, and you don't have to worry about dealing with an mp4 file. Right? What was really cool about that, we saw it take off like crazy and it was because of that simplicity, sales reps use it to quickly record and send, solution consultants to record a quick demo, and it was actually a really big turning point for us an organization because we realized we've been focused for a long time on all the really advanced capabilities of analytics and interactive videos and then we realized a lot our customers were asking "This is all great but we need to create more content more easily." That focus on just simplifying that process went such a long way and I think that's really the next big phase for video in marketing and in business, is just enablement and making it easier, and easier. I think tools like LinkedIn have to make it easier to record and share without having to jump through hoops and deal with things like dot mp4 files, which most people don't want to care about. Right? Randy: Absolutely. I mean look at Snapchat, look at Instagram. I mean that's the standard these days and these other platforms have to catch up and I think, similarly to your point, as marketers we have to catch up. Right? I always say we need to emulate what's happening on social because that's where people go for content. Right? People go to Facebook, LinkedIn, et cetera. You could say they go there to waste time or invest time but ultimately they're there for content and we, as marketers, are competing with those channels. In some cases, we're on them competing for attention or when we think about content on our site we're competing in the same way. So we got the video plug in there. We're running down on minutes here together but maybe just as recap, maybe you can talk about some of your favorite moments. Maybe it was specific podcast guest that we've had that you're able to take to your team. I know I've done that all the time where I'm like "Okay, you on my team, you need to go listen to that guest that we just had." Sometimes I'm even getting the recording before it goes live because I'm like so excited about it but is there any big takeaway moments that you've had in your tenure with us? Tyler: You know, it's a great question. There were a lot. One guest that I refer back to quite a bit myself now was [inaudible 00:28:06], when we talked about intuition and the importance of really trusting yourself and being a bit more creative in your approach to marketing and he also talked about the idea of creating series of based content in B2B and that actually was one of the catalysts to us doing our [inaudible 00:28:24] talks series, so that one was, I think, really great for me and it kind of broke that norm of the idea that you don't always have to prove everything with the data. Don't quote me on that everybody. But having a bit more fun, using your intuition as a marketer, and today that's actually still our secret weapon. Right? Because everybody's got access to the same tools for tracking and reporting. Our still uniqueness as marketers is our human element of our creativity, of our empathy with our audiences, so I loved that and there were a lot of great conversations we had on those topics of story telling, having customer empathy, understanding the ping points in the market and developing great content to address those. I think that the really overarching theme of that, which I will take to the grave as a marketer, is the importance of an outside in approach to your marketing, which is understanding the audience and their ping points, and letting that drive what you create as opposed to an inside out approach, which is here's what we do, here's what I want to tell, I hope you listen. I think that's the really big one that I kept hearing over and over again that has stuck with me, is that importance of audience empathy, story telling and an outside in approach to marketing. Randy: Jay has become the man on the scene. He's the number one requested keynote speaker now. I feel like we had him even before he fully took off, on this podcast. Listen, people come to Content Pros and they make their career. So we always throw a question at the end just to get to know the person and I feel like we've all gotten to know you really well but I'm curious because you're always really in with the trends. Right? I know you've got young kids, you know what the kids are focused on and then you had the Stranger Things spoof that we talked about, which I'm truly depressed right now that Stranger Things 2 is done for me. That show is amazing and I won't give any spoilers here but maybe you can tell us what are you either watching on Netflix or engaging with in the communities that you're involved in that you plan to infuse into your next big marketing campaign. Can you give us a sneak-peak of something you're really excited right now that you think you can have fun with next? Tyler: That's a good question. One of the things ... I try to watch a good diversity of shows but I'm a sucker for crime thrillers and what not, but the one thing that's got me going right now and Randy, this is gonna be a plug back to you to thank you for spawning this idea, was when I got the opportunity last summer at the Content Experience Conference, to be a participant on the Content Feud, which was your Family Feud version. I had a blast and I thought it was just a brilliant thing where we got to go up there and answer what are the top 5 for different questions and content marketing, and that has stuck with me cause we've always talked about parodying game shows and popular game shows in our marketing cause it's such a fun thing to play off of. So that's actually one that we've come back around to and I'm really hopeful you'll see some fun campaigns from us in the near future that are great spinoffs of popular game shows from many of ours childhoods as a nice nostalgia play as well. I'm really hoping we can pull it off because if we can, there's some really brilliant ideas about how we can work those. Randy: That's awesome. Yeah. We've had a ton of fun with event. 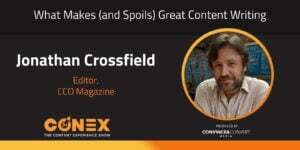 By popular demand, it will be back at the next Con Ex [inaudible 00:32:02]. We really have no choice. So Tyler, we're pretty much out of time here. I want to take a moment just to thank you. A lot of people ask me why I continue to do this podcast and for me, I always say aside from hopefully sharing great insights with the people listening, that this is selfishly something I get a lot from because every week I'm talking to a real thought leader in content, in marketing, who's challenging the way I'm approaching it with my team, how our company's approaching it and just giving me new perspectives. The real refreshing thing for me over the last time that we've spent together co-hosting here, is not just having that from the guests but having that from you, challenging people, challenging my thinking. I thank you for being part of this and hopefully we will bring you back as a guest as we head into the new season, which we're gearing up for. And if people do have time to listen to the next podcast next week, you'll get to meet my new co-host. I'll keep you in suspense so that you wait to hear who that's going to be. But, in the meantime Tyler, thank you so much. I'll give you an opportunity for any last words and ultimately you get to close this thing off this week. Tyler: Well thanks a ton and I really appreciate the kind words. It really has been a terrific experience having the opportunity to work with yourself and all the great guests that we've had. I think a lot of the ideas that I've brought to the table, frankly, are things that have bubbled up from my team and so I'm gonna do one of those ... I actually want to thank the team that I have here at Vidyard because they've all made me the marketer I am today. My advice for all of you is hire a better content marketer than yourself, hire a better demand gen person than yourself. Find smart people who can teach you every day. Be a strong leader but get good folks around you that you can learn from, that are real experts in their craft because when you find those people, it's a whole different ball game, what they can bring to the table. Always keep an eye out for good talent and learn from them, which is what I've done here and of course also from our guests and from yourself, Randy. So thank you very much. I look forward to continuing to listen and perhaps you'll have me back as a guest again at some point in the future and I'll share what we've been up to over the next year here at Vidyard.